From left are Mark Curtner, Aviation instructor, Tyler Wooten, Sam Combs, Jocellen Detwiler, Chris Carter, Adreienne Detwiler and AJ Zavada. DAYTON – Students of the Ohio Hi-Point Career Center Aviation Satellite program participated in the Science, Discovery and Family Fun event at the National Museum of the U.S. Air Force on Sunday. 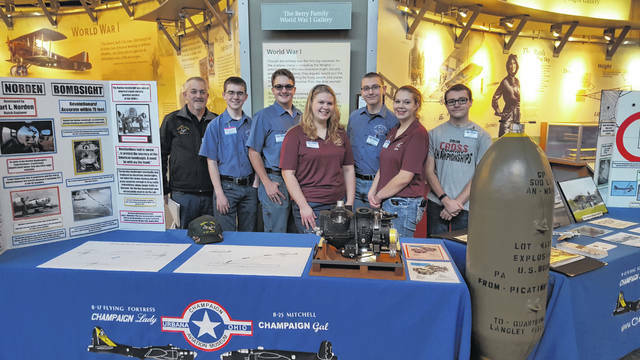 The students assisted with a display and presentation about the Champaign Aviation Museum and the B-17 restoration as well as explained the Norden Bombsight used during WWII to museum visitors. Under the guidance of instructor Mark Curtner, the Aviation students who presented were Tyler Wooten, AJ Zavada and Chris Carter of Graham High School and Sam Combs of Triad High School. The Aviation program, available at Grimes Field and Graham High School, is an Ohio Hi-Point satellite program, which brings career programming directly to students in the district’s 14 partner high schools.